Out here in southern Arizona I sometimes feel like I'm at the very edge of the earth, isolated. Not only are we a good hour plus from a major city with no towns of any great size between us, but the terrain looks like the outer edges, the rim, the end. Don't get me wrong. I've come to love the unique beauty of this high desert -- the endless blue sky, the subtle and changing hues of purple, pink, blue, and gold that dance over the mountains as the sun moves across that wide expanse each day, and the humming birds that often dance around the flowering cacti. 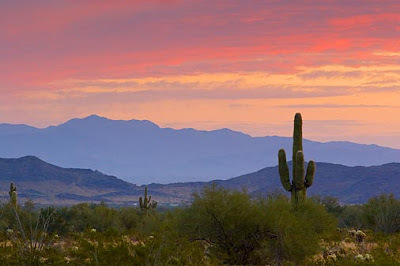 I used to think, when I first arrive here in Arizona, that it was "pretty in its own way." Then I thought it was amazing..."in its own way." Now I just think it's absolutely lovely. Period. But even with all its beauty, the rough and expansive desert can be a striking reminder of how far you are from, say, New York City. Or from my home of origin in the green and rolling mountains of the Southeast. Or from the ocean. Maybe it's the fact that you can see for miles and miles and miles out here. You can drive down the highway, look out the windows in all directions, and see for miles. Depending on where you're standing, you can see into Mexico or New Mexico. And there's not much to see in either of those places either, just more of the same. And so, looking around in search of civilization, where life is thriving, where things are happening, where people are bustling, you find very little. You feel like you are at the end, on the edge, out in oblivion. But of course, you're really not. Still, have you ever felt that way? Not geographically necessarily. But emotionally. Have you sometimes felt pushed to the edge, about to fall off the precipice of pressure and high demands? Have you felt on the outskirts? Pushed out, left out, ostracized, and discarded? Or maybe you've felt forgotten, alone, insignificant and unloved? We all feel at times that we are on the outside looking in. Whether you're standing in the wide open spaces of the southern Arizona desert or you're in a crowded room with no one speaking to you, you've probably felt far, far away from anything and everyone else. Or you may have been abandoned in some way. Or maybe just lonely. I was reminded this morning as I read my daily Bible reading (still walking through the Bible!) that we may be alone, on the edge of nowhere, on the outskirts, or completely abandoned by everyone else, but we are still surrounded by the most precious thing in the world -- the consistent and amazing love of God. Where I live I can see mountains all around me. All around me. They are strong, tall, forcible mountains. They peak over the clouds at times. Or the clouds may occasionally hide them completely, but I know they have not moved. Most every morning, the first thing I do after pulling myself out of bed is to look out the windows of my house and glance toward those mountains. Somehow their constancy, their majestic beauty, and strength give me assurance. They hedge me in, keep me from falling off the edge. They wrap around me and give me security. After all, they are just mountains. Placed there by The Mountain, who surrounds me wherever I go. If you are out on a limb today, deserted in the desert of loneliness, abandoned in the middle of nowhere, or far, far away from where you want to be, just remember: You're not alone. The Lord surrounds you like the mountain ranges that encircle me each and every day. It may be a little cloudy and you may lose sight of His visible presence now and again. But He is there. He has not moved. And He will not. The Lord surrounds His child. Forever.